In the whodunnit debate over the alleged sarin airstrike against Khan Sheikhoun on the morning of April 4, it seems to me Neither side has given adequate attention to this subject. There's an expanding white cloud at the time of the attack, and later a dense fog over the same area. That's reported by activists as sarin nerve agent, but as I'll show, this is a dubious and poorly-thought-out claim. The other side, so far, has either presumed no connection, or just not clearly thought about the possibility. This subject might be important, and while it's tedious and took a while, I feel it's worth it to help advance our understanding. My intention here, as it has been, is to propose a "false-flag" attack by local terrorists, in a theory that accounts for all available evidence as possible (unless and until it's proven unrelated or fake). As usual, all verbal accounts are open to question, but not to be ignored, and visual evidence is given preference when it's available. And so I will try to present opposition claims and assess them as carefully and fairly as possible - so in the end, when their story is shown to fail, it can't be said that's from any unfairness on my part. 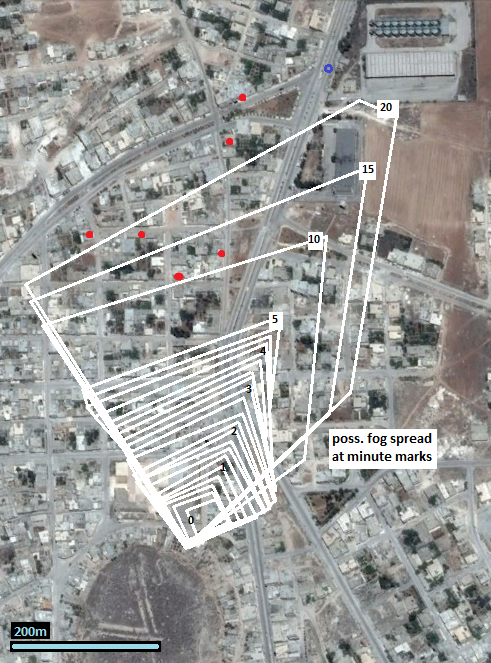 I really tried to see how this sarin bomb fog story might make sense, and nothing plausible seems to work. I establish this early on, and then spend some time analyzing the visual evidence to propose in some detail what I think might well have happened. Top: post-attack "3 plumes" video. 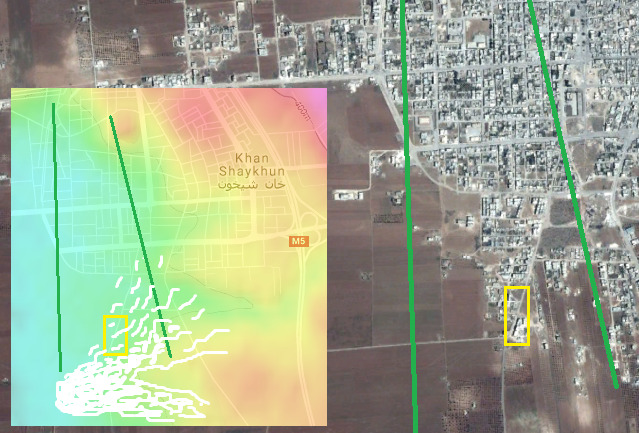 Below: the later spread of the alleged sarin vapor across the whole town. 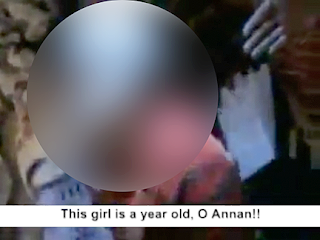 Their alleged video order is clear, but the time lapse isn't. The similarity of sunlight angles makes clear it can't be much time; 15-30 minutes seems a good initial guess. - blast plume #3 well to the southwest of those (likewise drifted away later). - also, dense fog appears further southwest (seeming to flow from the purple box), with no clouds or blast plumes seen there earlier. The emphasis here is the connection between that white cloud and that fog. 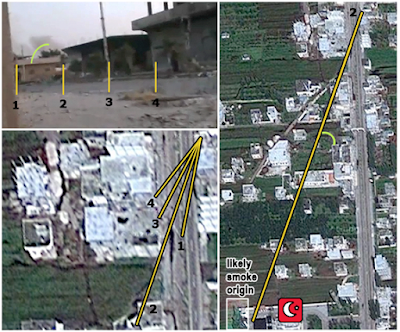 Is this, as opp claims, the sarin bomb's payload spreading on the wind to kill random local civilians? Important note: none of these spots correlates with the famous crater in the street near the grain silos and the city's central bakery in the town's north. 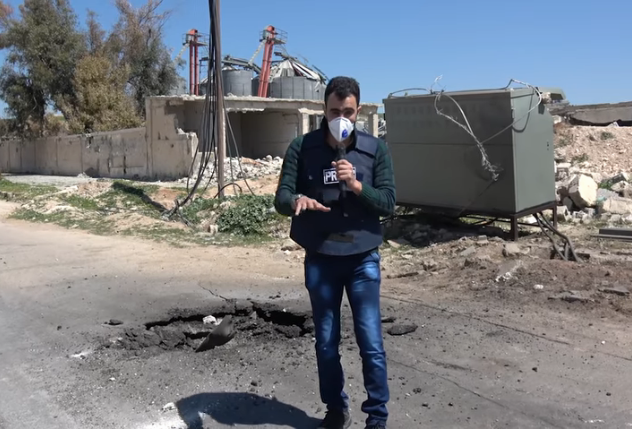 This (with Hadi Abdullah, reporting around 1pm that day) is the only spot so far shown and mentioned as the release point for sarin. But the space above that area is simply not included in either view above, being well off-frame to the left in both cases. Was there a blast plume there? There shouldn't be, for an effective sarin release as alleged. Was there a low white cloud? Something else? Or nothing? The video just doesn't say. Keep this in mind. First, I need to set a time interval between the video scenes. My initial comparison was unclear, suggesting the bottom view was later in some ways, earlier in others. Solar azimuth (compass direction to the sun) seems about the same, and hard to get a clear and logical reading of. Solar elevation clues, however, show clear and consistent differences, suggesting the fog scene is slightly later in the day. Trying to measure part of the clearest-seen minaret, I got the mess at right. Balcony shadows and glare on the domed top both suggest some kind of higher elevation in the fog video. Two low walls are clearer in having their shaded portions shift downward (below), but these can't be measured. For now I have to estimate the elevation difference is about 4-5°. The best time for the attack video is around 6:47 (the alleged time, and at least very close to the real time, by sunlight angles). A half hour after sunrise, the sun was 5.6° above the horizon (but still a bit below the features of this tall minaret, so still shining up, I guess). The later view would then be 7:07 (9.6°) to 7:12 (10.6°). That's about 20-25 minutes between videos. So, if these scenes are connected, that's the order they come in, and that's the basic time frame between. That fog has to appear in about 20-25 minutes. That's too much for some to swallow, and so far, here are the four main options I've considered, coming from opposition activists, from my own interpretation of that plus the visuals, and two other options offered along the way. Option 1) the white cloud is irrelevant, and the fog is a natural morning mist. Such a mist probably won't form that quickly, just after a bombing (or dissipate that fast, for those insisting on a different order, although that makes more sense). So this option all but requires they be different day videos, which is unlikely (same basic time of day and year close to April 4 by sun angles, no differences in vegetation or scenery, same wind direction, different and complementary vapor-fog issues, and both never before seen). I could cite the strange similarity to the rebel claims, but I suppose in this scenario where they had fog and/or attack videos from different days sitting around, they crafted the claims to the fake video. Still, I don't buy it. For those remaining at this point, the rest of this post may seem totally irrelevant. But until a date mismatch is proven (I predict never), I'd argue it's worth considering at least in the sense of "according to the accepted evidence," which may fall apart on analysis. 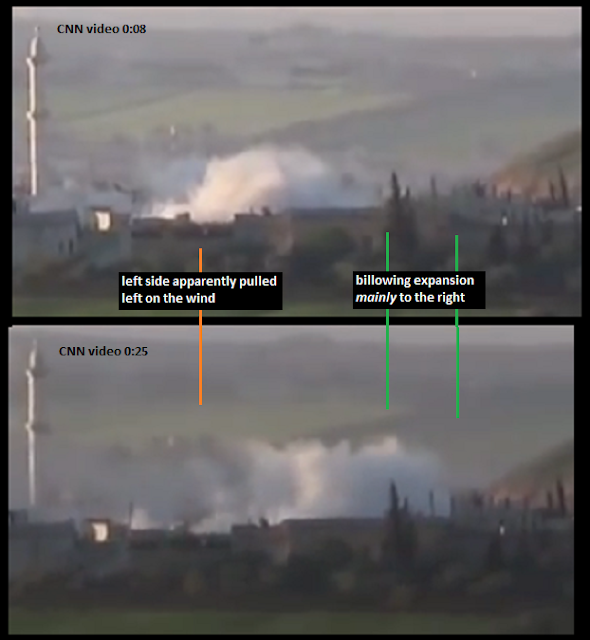 Option 2) the white cloud is irrelevant, part of seen blasts, and the fog is more attack-related smoke that forms a haze. This is a smarter theory, aired by most of my friends and research associates. Powerful blasts do often eject whitish plumes along ground level, in addition to the rising main smoke cloud (example). The distance is questionable, and probably impossible as I have it placed.So I suspect this is its own phenomenon, but so far, some disagree. Either way, residual smoke and dust lingering near the surface and drifting on the wind is surely part of the picture; the stuff that rose high with heat would remain there and drift away, but particles that never did that would settle somewhat and form a haze. However, while the appearance might be about right, the amount of it, and shape of the filled areas relative to a couple of non-blast spots raise questions about this as a complete answer. There may be much more to it. Let's spend more time on this one. 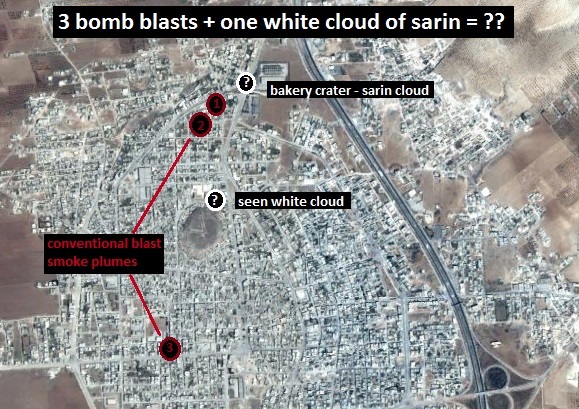 They claim the expanding white cloud is the, or a, sarin vapor cloud, from a bomb dropped by the passing jet(s). The fog seen 20-25 minutes later is the same very dense cloud, once expanded. If this is the same scene we see on video, and it sounds like they're claiming it is, this has to be called out off the bat. Wrong Kind of Spread: I'm not really an expert, but as I gather, a realistic spread from a one-time release following on a sarin bomb drop will have a fairly predictable shape and behavior. Charles Wood did some great theoretical gas mapping for the 2013 Ghouta incident at ACLOS. He knows at least a bit about these kinds of things. I discussed this with him, and he says the kill and danger zones for any sizeable sarin release is larger than I thought, on the scale of a kilometer to kill, and maybe up to 14km for lesser effects. The shape of the affected area will be sort of elliptical or oval. This is caused by the roughly circular initial release cloud, maybe 10 meters wide or so, drifting on the wind. I suppose really it just diffuses, but with the middle staying stronger, rounding off the fuzz into an oval is fairly close. That's all it does - get released once, then drift on the wind, expanding as it slowly settles or evaporates, harming as it can along the way with weakening of its effects, especially along the expanding edges. It should take about 2-3 minutes for any visible plume to drift off the distant video's field of view. No more sarin would follow that. At right, a crude graphic to show this idea - not accounting for amount, exact plume size, exact spread or distance, just the basic idea, and using a polygon instead (limitations). The center line runs one kilometer from each release point we're considering, on a heading of 45 degrees (wind). The true angle could be more northerly. One km is just the deadly range; lesser effects would go on much further. I also made the main areas probably too wide by a good margin, just to not overdo the point. We'll see some elongated but narrow field just along the wind's direction. Nothing about this will push against the wind and spread in all directions. Note: All agree they fog came out of the bomb after impact, starting at ground level; it wasn't the more deadly aerial dispersion used in professional sarin bombs were designed with in the Cold War, like the kind Human Rights Watch fingered with almost no evidence at all (Soviet-made KhAB-250, apparently with a non-functioning proximity fuze). And for what it's worth, the alleged radar tracks provided by the US Defense Department show the jets never flew directly over the crater, just 2-3 km south (see the when and where). If so, they'd have to use missiles, not any air-dropped bomb. 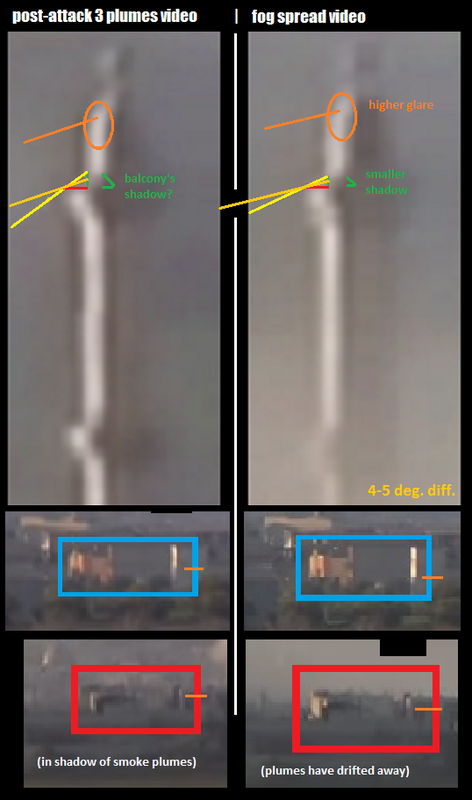 And this better analysis shows it's more likely a regular ODAB-500 air bomb remains we see. How that all adds up is another story. Let's back to the one at hand. Two release points are shown here, and I'll explain that soon, as I try here to be overly fair to the opposition claims. 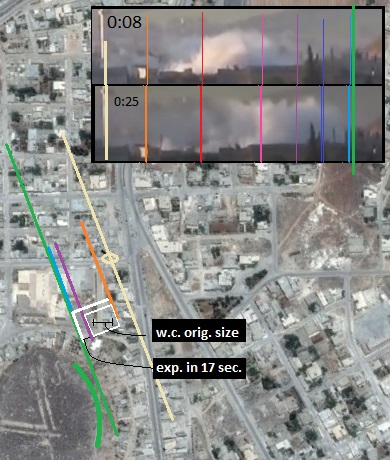 So, let's say they have 100 kg or more released by this hypothetical Assad bomb, and there were two of them in this area, and they had an extra-wide initial dispersion, with fat plumes like I show. Still, I don't think that can explain what we see. The fog is just too massive and widespread, and it's not a match with the white cloud or with the southwest fog spot, which show or suggest a prolonged, massive release of vapor, vigorously pushing in all directions, even against the wind at its origin. Even with the expansion seen with the white cloud, it would have to continue for many minutes to fill the area seen, probably for the full 20-25 minutes (I try to map this below, to clarify the point). 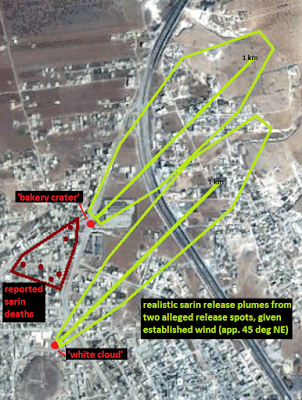 What Assad bomb can keep spewing sarin fog for 20-25 minutes? I imagine none of them, and this must be something else. I could invent them a new type of mass-vaporizing sarin barrel bomb. But I just don't feel like going this far. So far, they've shown debris for something more mundane and incapable instead. But I will skip overly-literal readings of their claims to let the opposition have a best case scenario, between words and imagery, for a chance at working out. Considering the further problems they present with making sense of their claims, this is the only way to keep their story from dying too quickly, to stay engaged until the deepest debunk is found, so even any improved versions 2 and 3 they come out with will be set to fail before they can even walk. How Many Sarin Clouds Reported? This Reurters article cites Hussam Salloum, a jet-tracking activist, saying a single Su-22 "dropped three conventional bombs, and a fourth one that made little sound at impact but produced a cloud of white smoke." That left "three columns of dark smoke and the white cloud nearer to ground level," which is linked to the sarin release. Note there's no room here for another white cloud, with just four bombs. And note that conventional high-explosives blasts cannot be sarin release points (the heat of detonation would destroy the fragile nerve agent. That will require a low-heat release of vapor (small droplets in suspension, because it's a liquid, not a gas). And this will work best with night-time or dawn attacks, when it's cooler. This was at dawn, which makes sense. Referring to this alleged vapor, Salloum said "the smoke was white and thick" when it was a cloud among the blast plumes. But then, as Reuters passed on, it "began to spread out across the town, until there was a layer over the town." It's like he was really there, or saw the videos. He seems to be describing, as seen, plume 1, plume 2, the white cloud, and plume 3. 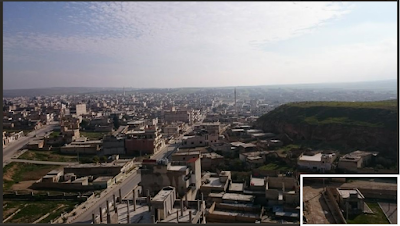 As noted, the famous crater near the grain silos, the one spot everyone specifies as where the sarin was released, is not included in that view. If that's what he means, this fails too badly for my liking. It misses one of two important points, either the famous crater, or the white cloud. Maybe he just missed something? Is yellowish smoke on the wind the same as an expanding white cloud? Or are they talking about two different things in two different places? It's not clear. Perhaps Salloum an Helou both mean the bakery strike, and the video just didn't catch it. If that was whitish and expanding, it's similar to the one we do see near the tel. But then neither mentioned that spot, and it must be something else similar but unrelated. But this is not the fairest. Because of the established wind direction, that would leave no plausible origin for the sarin said to kill all the victims perfectly upwind of that spot. The crater site is nearly irrelevant - the wind would blow its alleged sarin over the farmlands and very few homes, including none of the ones reported. The people cited must have been (allegedly) killed by sarin from the other spots. That's why I'm leaving all possible release points on the table, to not make it too easy to slay this terrorist lie. So to be more than fair, let's say there was a second pass, a second jet, or somehow more than four bombs. Let's say there are two white clouds in the town's north, and Salloum and Helou perhaps each reported one and missed the other, or they both missed one of them. And then there's the southwest fog area (purple box above), with no visible cloud at first, but later a giant smear of fog from there along the wind. They don't mention this either, and it's possible to just miss it that far out. So between words and images that's at least two and perhaps three alleged release points. 2-3 sarin bombs plus three conventional blasts means at least 5 or 6 bombs/missiles in total. They may claim just this eventually, as their original story falls apart, so let's get ahead of the curve. As we'll see below, the fog seen could then reach the placed victim locales; the white cloud's portion at least, between expansion and wind, is somewhat likely to coat that area, depending on the finer points. But are we proposing the Syrian air force dropped two or three fog machine sarin bombs? Each must have held... a lot of this sarin, and some unknown mechanism to dispense it in rolling masses for probably 20-25 minutes. If this preposterous weapon exists, then maybe it's how Assad could actually kill all these people with his dirty terrorist-grade sarin. Otherwise, it's just not possible, and something else has to explain this fog. The white cloud, and at least one other like it, become the fog seen 20-25 minutes later. I propose this, if not as gospel than as worth testing out. It's not clear what the vapor/mist/smoke/fog/gas really was, but it didn't come from the passing jets. It's most likely a visual effect concocted to line up with the false flag rocket attack, which had been timed with the passing surveillance jets. I've though of simple pressurized steam made using boilers and lots of water, that might form a fog in cool conditions. But the high-drifting mist we see might be too light for that, more like the toxic white haze from insect fumigators (video - warehouse fumigation in the US). It's blown out at high pressure, persists, expands, and quickly fills this contained but very large space. Imagine five guys with these, or some giant truck-mounted version. It would be loud, but maybe running indoors or muted somehow, with a solid tube blowing just the vapor and not the noise out over the town. Unusual chemicals could be used, but consider just the common types used in fumigation scenes like the above and in homes in the United States at least: sulfuryl fluoride (Wikipedia), for example, has an ILDH (immediate danger) rating of 200 parts per million. It's colorless and odorless in itself, but "Inhalation of sulfuryl fluoride is hazardous and may result in respiratory irritation, pulmonary edema, nausea, abdominal pain, central nervous system depression, numbness in the extremities, muscle twitching, seizures, and death." That's quite similar to what's reported. And then, added later: here's a some machine rebels used in Aleppo, with burning tires as the base material. Areas can be filled with devices like this. This was used back in November to lessen visibility of alleged attack jets, or as the video puts it, as a "smokescreen no-fly zone." It may have also been used to generate the smoke for false air attack reports. And here in Idlib, it could be the same thing used in a smoke-screen operation, to cover a false-flag terrorist chemical massacre, in pursuit of a Libya-style "No-Fly Zone." Or it may be no effects but visual; it's just a man-made fog, and all stories to the contrary are lies. That, option 3, and then option 2 are my favored possibilities at the moment. But putting aside just what it is, we can see it's white (or very pale in color), very copious, drifting on the wind, and covering a large area that seems worth mapping out. If it's option 3 or 4, and the white cloud and the fog are related, - the time difference estimated at 20-25 minutes for that cloud to expand into that fog be it sarin from a dropped bomb, or unknown mist from an unknown fakery method. We can get a better idea of which makes more sense, as we often can, by making good use of the visual evidence provided. I've been asked how can the top scene in my starting graphic can lead to the second scene in the apparent lapse time. My answer has been and remains simple; the expanding cloud would keep expanding in different directions, and smear away on the wind to the northeast. With 20-25 minutes of that, an area of this middling size and beyond could easily be coated. I used a more detailed image with different lines to place this expansion on the map. beige, minaret - orange: app. left edge of seen vapor (stays steady) - purple: app. right edge at start - light blue: app. right edge 17 seconds later - green line (almost on blue): app. start of hill slope. Mapped out, and adding a hair of growth towards the camera, that's decent swelling for a quarter of a minute. Also we can note if the wind is from the southwest (it is), this is in the wind shadow of the tel. Its north corner near the orange line would be most susceptible to wind smear, as we see, while the inner blue line side can expand with less wind, as we see. Wind aside, it's probably trying to expand in all directions, but likely more to the right/west at this moment. Would it keep billowing that way the whole time, or vary it direction? That's not clear. So it could matter ... in a visuals-consistent (reliable) version of option 2 or 3, that fog would reach the victims' homes. But as explained, it's not consistent with option 3 under normal circumstances, since sarin bombs don't just pour the stuff continually for tens of minutes. And here's how it looks anyway on video,from a distance to the north - apparent fog density (as much from angle of view as from actual thickness at any spot) considered across the field of view. The 2 green lines mark the densest area of fog in the middle, with the middle minaret marked in blue - 4 yellow-green lines mark middling and thinner zones to the left and right of that. Mapped beneath: heavy white lines for thick area, etc. The west edge at the hill cuts off visibly, but east clearly has copious fog continuing off the northern view's left edge, so continuing an unclear distance to the northeast. The actual north-south boundaries of this fog area are pretty unclear. The north is what matters, and all we can say is it's on the south side of some ridge we can see in the distance view. That seems to run just north of the curving (Corniche?) street here, traced in purple. I traced a possible cloud shape in yellow-white, considering expansion, the wind, and the hill's wind shadow. By this, the placed homes would be between the green lines and across the left of the image from there, roughly as shown, and then labeled for relevance. The places, if not the actual people, may have been in that fog. Again to be overly fair, I tried to fudge the expansion north enough to explain the reported death sites and area. It's not that easy. Different versions include some, all, or none of the homes. Effective spread could be more or less than any of the versions shown here. I don't really know. 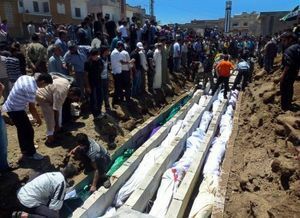 - how could a sarin bomb in any location do this? - where are the other dead people closer to the cloud's origin? - Why are they only reported near - but not at - the far edge of its possible spread, in a strip that's also perfectly upwind from the irrelevant crater? - again, this wasn't the allegation anyway - they've never shown the site of this possible sarin release or spoken of it. I had to propose this for them in order for their story to even possibly work. Why? Is there something embarrassing at that origin spot, perhaps just inside the fenced courtyard of ... what is that, a school? The kind usually shut down and taken over by Al-Namechange Front as a militant base? This is something no one else seems to notice, but there's a whole other field of fog that's appeared in the same 20-25 minute span between videos. There are a few possibilities for what this is, and they're the same as above. It's also has a distinct shape we can see because of the general slope of that area, that includes a good-sized hill on the left here that divides the fog as it apparently drifts northeast (left and towards the camera). Here it splits into more east, and more north, or towards the camera. 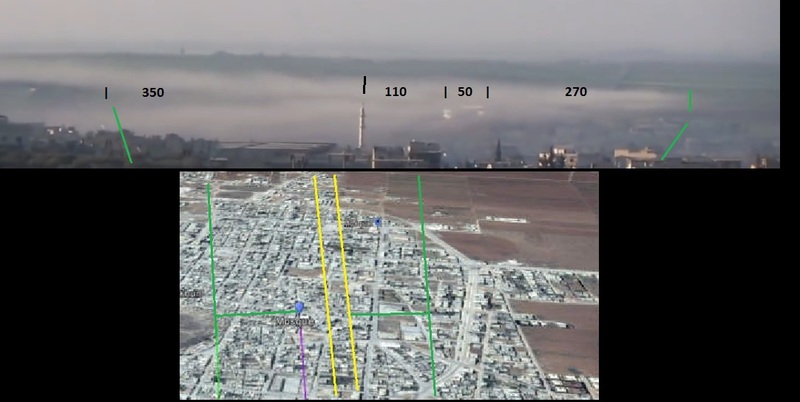 Using Bellingcat's FoV study, placing the green lines to rough proportion - on the left, beginning of the serious hill that divides the fog, and close by, the edge of the tel that blocks the rest of the view. To the right, the apparent edge of this fog field. That app. big building that pops out (above "primary spread" label) would help set the area if we could identify it. Marked in yellow below, this seems to be two large buildings in an area lining up so the right one mostly obscures the left one. That jumble is the furthest things out on an up-slope, with empty fields behind them. Here's a sloppy graphic that shows my work on where to find this place in the gold box. compared to topo map to help set the shape of where it divides, and using that hill to set the origin point to its west - all lines up, and this is pretty close that what we see, if there was a satellite view of it. All considered, I suppose the actual release point is further upwind than any of the spots I indicate here - further south of the dividing hill, and further west. So the original fog area would be larger than shown anywhere here. Do they have an improved version waiting to come out? If we amend, include implicit video claims - the bakery crater, the 'white cloud, and the spot SW of town, perhaps another - the only spot they've noted so far doesn't matter, but the others they might now mention, belatedly. If it's built-in at the start and latched onto later, but ignored in-between - is that just a goof-up, or a sort of long game they're playing with investigators like myself? In case it's the latter, here we are getting ahead of that possible curve. Could they coat the whole town like this? The video suggests they did. What's required in between is they poured their fog continually for the unseen span of 15-30 minutes. Do we think this makes sense? This is a strange pattern to set up intentionally. With two of the three spots primarily covering just the outskirts, and the bakery crater being downwind of the white cloud site, so its plume pretty much continues that same spread. To kill people, or even to cover area where many live, this is a poor use of whatever that is. A fourth release point would make sense in this context, and a reasonable spot has already come to attention, indicated with a question mark here. That's the mysterious small cloud of black smoke somewhat near to plume 3 (not clear just how far north or south along the line of sight, nor therefore how big the plume is - but most likely north and not big). This is shown below, on the right side from plume 3 (facing south). This seems attack-related, but neither a HE blast nor a supposed sarin cloud. Is that the gunpowder-type mini-charge to open a sarin bomb's valve? Or fuel smoke, maybe the generator to run a "fog machine" being started up? This whole area seems to be on a down-slope, as well as mostly hidden behind the tel from the northern views. So a fog field just as large as the others could be hiding in there, perhaps wrapping around the east side of the tel and merging with the mist seen there. * The witnesses only talk of the irrelevant spot, showing the crater and weapon debris at the bakery crater, and providing stories of nearby victims. 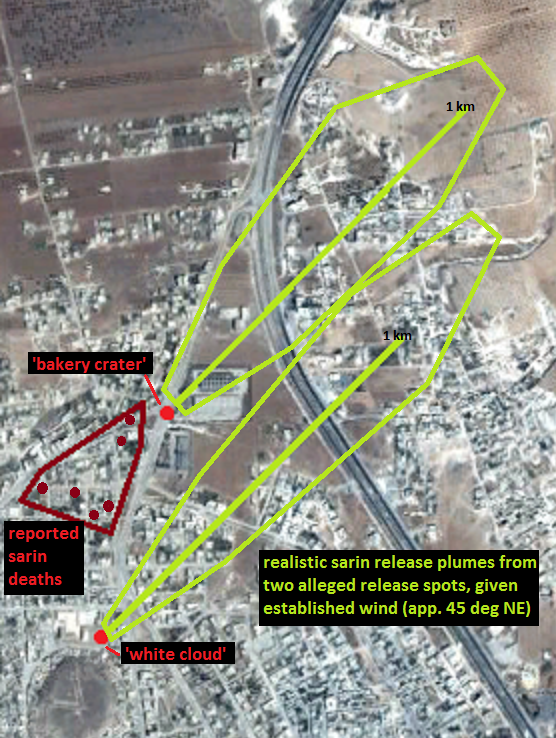 They do not show what hit near the tel, nor in the southwest area, nor at any other potential sarin bomb site. They don't show debris or a crater, provide nearby victim stories, nor even mention these spots clearly. On that basis alone they could be discounted, but that's not the kind of exercise I'm running here. * Of all the covered areas, perhaps half the town, still victims are reported only in one strip of a few dozen homes that's still better described as upwind of the one specified release point. Even imagining other versions. it's only possible to include those among hundreds of fog-coated homes all across the town where no one was reported dead. That just doesn't make sense. * They do not show the telltale fog spread actually happening, missing some 20 minutes of oppotunity to show us. Maybe that's because it was deemed too unrealistic in action. They just showed the after effects, perhaps - once the process of special effects fog creation was stopped, after 20 minutes or more. If this is their important visual effect, why didn't they show more of it, even after the wrong-looking process was completed? White Helmets with gas masks and suits existed, but aren't seen running in it to save people anywhere, with or without fog. Maybe that's because there were no rescues to show, because, as I and others suspect, the victims were all gassed in some centralized, controlled locales. They would first be loaded into truck at the gas chamber sites, which they don't want to show us. This is the core of the story, the murdered Syrian civilians - we can see some were poisoned with something - probably not sarin, or very weak if so - that damages the airways and makes breathing difficult - others, as I noted at the start, were apparently finished off with slices to the skull or holes poked in the throat - Islamist methods - and this happened just days after terrorists had kidnapped over 100 fresh civilian hostages in two nearby towns they briefly conquered. To be seized like that, the applicable rules mandate they should be non-Sunni religious minorities, or from Sunni families identified as supporting the government. It's all reminiscent of every other chemical massacre I've studied. How can I avoid the same conclusion? As part of this, it seems they had some special effects vapor, lots of the stuff, to prove on video all about Assad's sarin fog machine bombs. 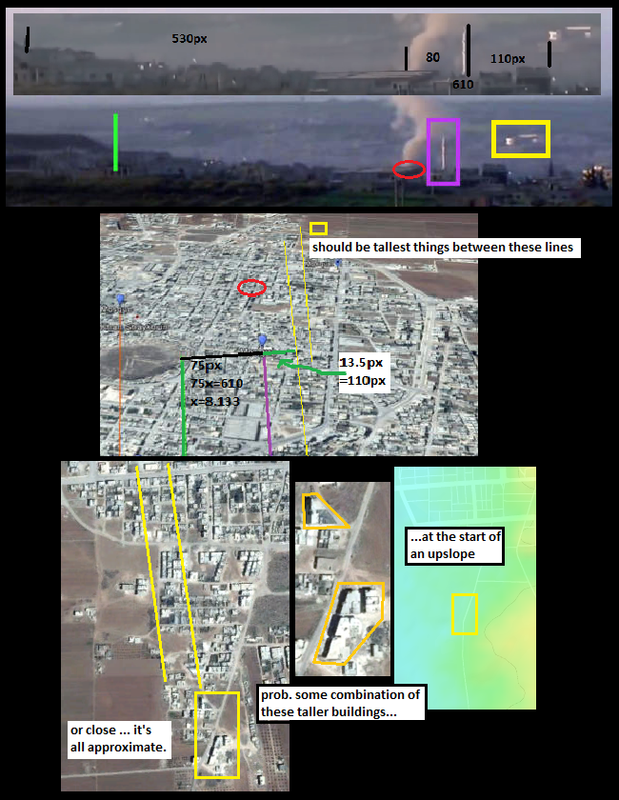 They got the airstrike part accepted just as automatically as usual, but they also wanted a dramatic sarin fog we could see. Lucky for us, that same effect all but proves it's a fraud, and part of a criminal deception by the foreign-backed terrorists bleeding Syria. Especially helpful would be anyone from the millions of people preconditioned to discredit the report's findings, but patient enough to actually show why one should dismiss it, rather than just presuming it and screaming it as an obvious fact. It's a sacrifice to look at the upsetting details, and to and get specific and run the risk of being specifically wrong. 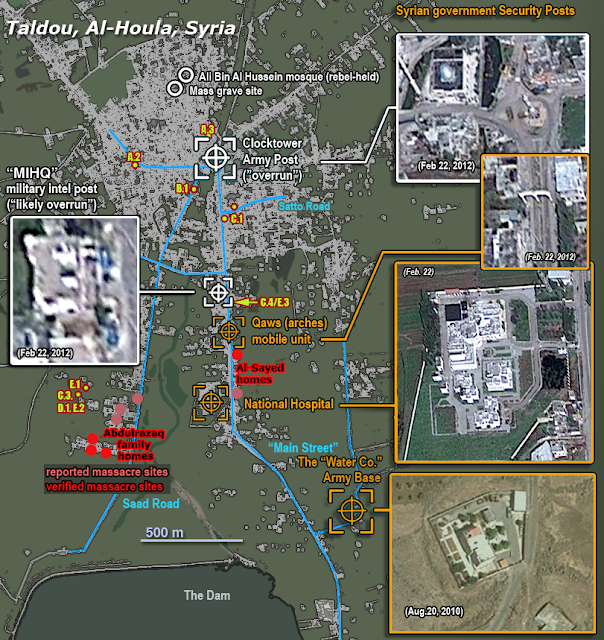 But if no one is willing to take the challenge, then this report will continue to stand as the best answer yet as to what happened on May 25, 2012 in Taldou, al-Houla, in Homs governorate of the Syrian Arab Republic. The best comments will directly discuss videos we cited and our analysis of them. Your criticisms will be more powerful and relevant if you at least skim the report, rather than presuming what our arguments are (they aren't the standard ones). 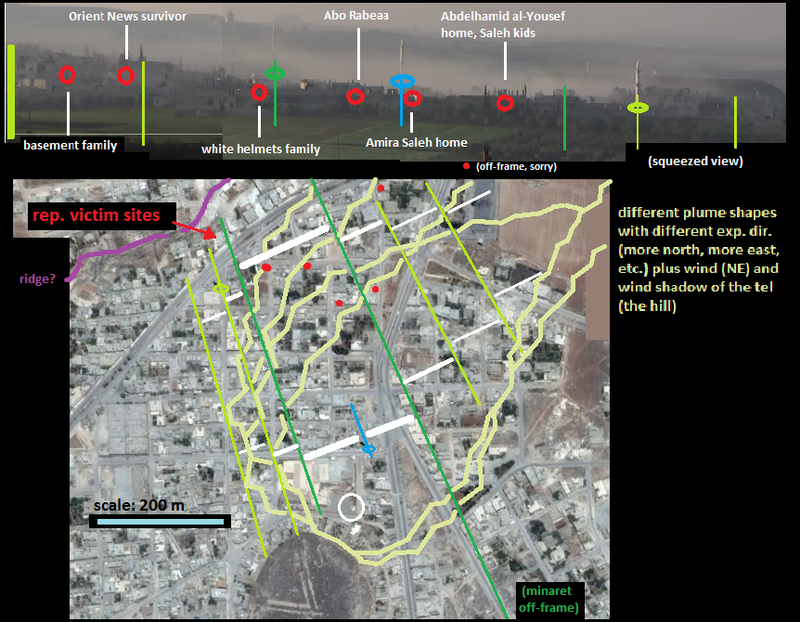 A decent idea can be gotten from the photo-essay part of the recent post five years of the Houla Massacre lie. 1) Readers who read the report and think they have a serious challenge - or even a question - can first do so here, in a comment. 2) If it turns out interesting enough, that and the related discussion could then be copied or even moved (you can run out of space here!) to a new post where it's related, with space below for further discussion on that narrower subject. 3) Anyone who seems to or thinks they have a detailed case with many points could let me know and I could create a special debate post (mostly blank to start but with fresh comment space, and space for distilling any solid points raised into the main post. 4) Each of these would be given a link in this post and brief notes as warranted. Any corrections we consider sufficiently justified will be made, noted, and become their own parts of the investigation thereafter. 5) If you're not sure you have a point but think you might ... it's a question. Go research to find out, or ask me. Ex: "this part ... sounds like it can't be right. What is that based on? You cite "x" but I don't get how..."
6) A better idea on approach would be a better idea. So bring that too if you have one. - questions (like how we decided on a point), etc. 8) I feel confident enough on this subject I can afford to be more than fair to any counter-arguments anyone has the courage to offer. There are no free rides right to a legitimate win, but I'll grant any point in a way that's more than fair. ** Anyone else at Bellingcat willing to step up? Toller? Triebert? Let me know and I'll create a special space. Tag team is okay. First request should be made in at least one initial comment below. May 25: I've now had one anonymous comment that didn't tackle the core issues at all, but at least is/was engaged enough to speak up. For that, kudos. Anyone else? I just tried some riling up on Twitter. A serious response will likely a day or more to materialize (anyone who looks close enough to really try should be a little stumped or even intimidated). I'm watching comments (though I'm away from the screen for many hours at a time due to life). I'm also watching the "spam" folder in case a comment is wrongly routed there. C1 July 21: because I already know it's needed, a space to review Abdulrazaq-Abbara-Clocktower Connection? re: page 34 in the report. C2 Dec. 12: (minor)page 41, left-hand graphic: the orange arrow should point to the smaller building just south of the one indicated. Otherwise, none yet as of December 23 (just started really trying about a week ago). C3 Feb. 12 2015: I challenged my revised time zone decision. It was right to reflect DST here (unlike in the 2013 report), but that was on top of a wrong time zone, an old error that got set in stone. I thought Syria was in UTC+3 with Iraq, but it's in UTC+2 with Lebanon. I'm embarrassed that underpins most of my/our Syria research. In the 2013 report, the two errors cancelled out to a correct time, while in the 2014 report fixing one error but not the other means all (video/sun) times given, from sunset across, should be read as back down one hour. This has minor effects on narrative lineup (in some cases improving it, and in no cases making anything impossible, or causing any other problem). 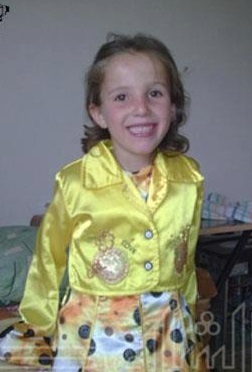 On the afternoon and evening of May 25, 2012, in the village of Taldou, in the Houla region of Homs province, occurred a hideous crime that must never be forgotten. Well over 100 civilians of a few targeted families were slaughtered with guns and bladed weapons, among them over 50 children, some of those just babies. But however it was accepted, the Houla Massacre is the gold standard of "massacre marketing" by the Sunni extremist militants in Syria. It was they who wanted escalation, intervention, and regime change, not a Kofi Annan peace plan, and this incident delivered. The best evidence - the video record and reports that agree with it - is clear they were responsible for the act of brutal mass murder. They earned their reward from the "international community" themselves, rather than having the "Assad regime" hand it to them. That their illogical and unsupported narrative is retained to this day by the powers that be in Western and allied government, the mass media, and "human rights" organizations is a sad shame, and an outrage. I've marked each anniversary in some way. * Year zero, 2012: upon news of the massacre, I was infuriated and started studying it and other Syria events, soon co-founded A Closer Look On Syria in June with CE and Petri Krohn, focused on a Houla Massacre page and sub-pages. We worked together and got the case pretty well solved by year's end, with research-based articles by me up by early July, 2012 (star witness re-considered). * Year one, 2013: report: Official Truth, Real Truth, and Impunity in the Syrian Houla Massacre - compiles research-based articles of special value into one informative report (authors: Ronda Hauben, Alfredo Embed, Marinella Corregia, myself). The promotional article was widely-read. * Year three, 2015: Three Years After Houla: Lessons Remembered, Forgotten, and Never Known - a decent review article, but not the best marker, and made available the gruesome 2014 morgue photos of most victims including (alleged) family details (they were posted on Facebook, and stayed up even longer than they should have, given the rules against gory images). 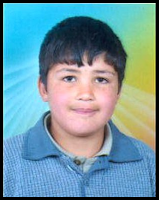 * Year four, 2016: Instead of Houla, I focused on the same-day 5-year anniversary of the alleged famous death of 13-year-old Hamza al-Khatib (at right - remember that kid? article, later report) By the best evidence, he was actually aged 12, about a week shy of turning 13, when he was probably killed and mutilated on April 29, 2011, by terrorists occupying the area around a military housing complex they were trying to break into. After the attackers were chased away, the army found some 29 bodies of men and boys left behind, including Hamza's. Activists would say he and many other were arrested from the peaceful protest, and his brutal treatment clarified a "turning point" where armed resistance could only increase. It was nearly a month before the government finally found the right family to hand Hamza's body back to on May 24, and the next day, allegations emerged he was just killed on the 25th after a month of torture. But the visuals prove that wrong; his body displays green and black patches to prove weeks of slow, refrigerated decay. Other victims shown off with the same story also have green patches and other signs of the same kind of decay, starting around April 29. But the dimwitted opposition activists had stories anyway: people who saw the impossible torture of the living boy and some of the other victims, long after they were dead. These patently false claims were widely believed at the time, and lacking any apparent care, they just sit there stupidly as accepted truth to this day. 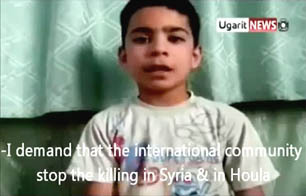 So it's a lot like the Houla Massacre, that wound up marking the one-year anniversary of Hamza's alleged death. * Year five, back to Houla. After two years of little to nothing, I should do something powerful. I don't know what yet, but this atrocity should never be forgotten. Accepting ideas here in comments, or elsewhere. Others could help spread the word - especially the 2014 report. Write an article, submit a comment on the upcoming 5-years-never-forget articles that will still blame Assad. The best-evidence version of May 25, 2012 will have to be crowd-forced into being addressed and finally accepted as the kind of precedent it truly is. I'll offer two related mini-articles here, starting with a sort of a photo essay. Recall the accepted story: Al-Houla was a "rebel-held village" that suffered "army shelling" May 25 after noon prayers and/or a protest or a small clash rebels gave up on. 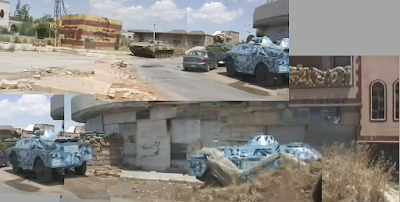 This shelling battered Taldou especially, forcing FSA defenders to withdraw, leaving the way open for Alawite and Shi'ite "Shabiha" militias to invade the the town and massacre Sunni families. * Note: times given in the 2014 report were calculated wrong, given as one hour ahead, so this is said to be 2:25 pm. Apologies. 2) An "army shelling" perpetrator seen close-up with his RPG launcher after launching the clearest "army shelling" of the day. This is hours later than the above scene (about 6:11 PM +/- 5 minutes - report says 7:11), on Satto Saad road, just south of the overrun or bypassed roundabout army post. 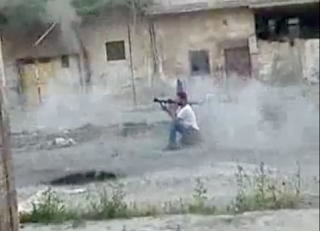 3) More of the fierce "army shelling" of Taldou, as caught on video. Around sunset (7:15-7:30 pm, not 8:15-8:30). A group of Arabad Bin Souriyeh battalion fighters, clean-cut and Western-dressed as usual, runs down side streets (THIS is Satto road - 5/26). One fighter runs out on main street, pointing his RPG launcher south towards a mobile army checkpoint at the arches military intelligence headquarters (I got rusty). He fires and seems to cheer a hit as he runs back for cover. Pro-government witnesses say this post was attacked once around 1 pm, and again more forcefully around 7, when it was overrun. Smoke rises from this area around 7:19 pm (shortly before sunset), on a distance video posted May 25. (exhibit H.3 C.3 in the 2014 report, saying app. 8:19) One of the families massacred that day is said to live in this same overrun block. Named Abbara and perhaps other names, they were apparently intermarried with the core targets, the extended Abdulrazaq family, but a confused record seems to try and conceal that (as sort-of explained here) (and recall the opposition story denies specific family targeting - random Sunnis were chosen, not a particular clan - note and correction, 5/26). 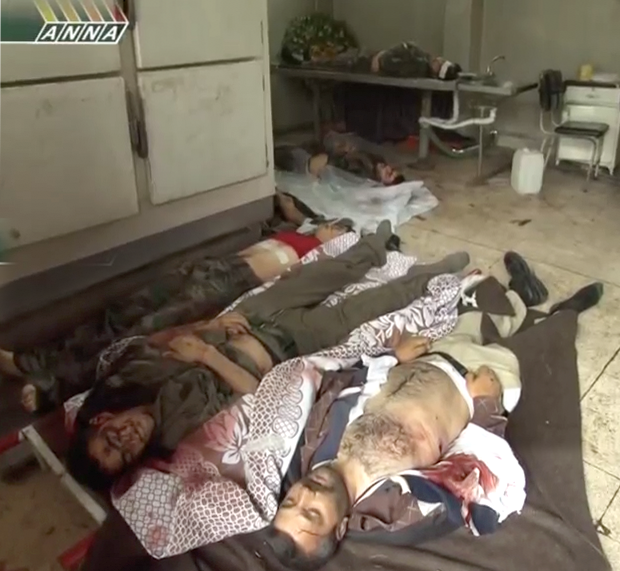 7) Some of the many soldiers and a militiaman (aka "Shabiha" - singular "shabih") allegedly killed by the "army shelling" and/or "Shabiha invasion" of May 25 (pro-government ANNA News (Abkhazian, Russian-ish) filming in Taldou, May 26, panoramic view from video). (Unseen) It's said one soldier had his throat slit and was tossed from a window of the hospital, apparently for changing religions. Another soldier was reportedly burned alive, while (Sunni) others were captured and given a chance to "defect" and join the FSA, or die. A soldier on leave with a broken leg was among the targeted massacre victims. His eyes were gouged out, as he was killed alongside his father and little sister All sides agree this al-Sayed family was pro-government, with much military and police service. (note May 26: the killed father was a retired policeman) They lived across the street from the National Hospital, by the way. 8) Smoke from the National Hospital as it was burned during the "Shabiha invasion." In a sunset battle video on main street, some billowing black smoke can be traced to the hospital, suggesting it was on fire by then. The time is 7:40 +/- 8 minutes, making it the latest video seen, perhaps after full sunset. (exhibit E.3) The hospital was apparently was not burning yet in early videos of "army shelling," which left trails of smoke like RPG exhaust in the hospital's basic area. (exhibits E.1, E.2). Pro-government witnesses say rebels sacked the hospital, perhaps after circumventing the arches post using a side road instead of overrunning it from the north. What happened is unclear, but it seems they killed a wounded soldier there at least, looted the place, and set it on fire. The UN investigation denies this quite clearly, as they question why the government-run hospital never bothered helping the massacre victims, leaving rebels to do all the body-handling. It doesn't seem they noticed or mapped out this smoke plume, so maybe that decision was premature. 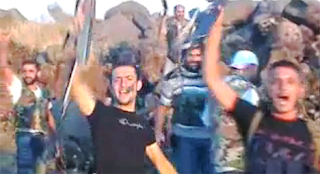 10) Totally or mostly unseen "Shabiha": The FSA's infamous Farouk Brigade was reportedly involved but unseen, more camera shy than the guys we keep seeing. 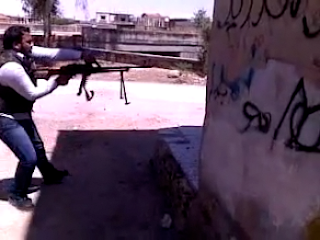 Reportedly, since-disgraced commander Abdulrazaq Tlass headed operations, and apparently lost an uncle in this battle for the Houla Massacre an fighting related to earlier Houla Massacre where the boy with pro-government wrsitband was killed, back in early April 4 of 2012 (again, I got rusty). A local criminal named Nidal Bakour led another "FSA" group, while Haitham al-Hallak led another "FSA" group that focused on the al-Sayed family homes. Opposition records say Hallak, a defected policeman from Rastan, was killed in the battle, but some seem to list him as Haitham al-Fuzo (video still). Already the Syrian al-Qaeda affiliate later called Jabhat al-Nusra (now I like Jabhat al-Namechange) was on the scene (announced in January, 2012, by this source). Then working the shadows and including eventual ISIS types, an August DIA cable seems to mention them as being called Jaish al-Nusra. In this first part of 2012, they were growing in size and capability, as if they had just scored some secret victory and attracted new recruits - hmm. 12) The Victims gathered: after the "rebels withdrew" from their own beloved Taldou, the "Shabiha" invaded and killed over 100 civilians in their overrun homes. Luckily for the cause of "justice," even as Syria denied the massacre, the "Shabiha" then walked away and left the bodies behind for "rebels" to find when they returned later that night. These were wrapped and brought to their main mosque and buried in a mass grave the next day. The activists found no family contacts, even extended ones, to hand the bodies back to for regular burial in family plots. Or anyway, they decided to just do it all themselves, burying what was in fact evidence of their own grave and massive crime against Humanity in one big trench. And that's the kind of evidence for crimes against humanity provided by these hate-filled monsters. They keep just 'finding' dead Syrians and all-knowing "survivors," and handing non-stop allegations to the wealthy elites sponsoring them, just to punish and bleed Syria, weaken Iran, ensure a "new American Century" of global leadership, etc. The blood spilled in Houla is just one of those awkward parts of an otherwise profitable or widely-supported program to "stop the killing" and "bring peace to Syria." Unlike little Ali, the witnesses in the mass grave are the people the international community really let down, failed to protect, and still disgraces by blaming their overrun defenders for their brutal murders. Unlike little Ali and other liars, the massacre victims can't tell her own story, and have the "activists" of "liberated al-Houla" lodging one for them in their absence. What they suffered is hard to fathom, as a safe late spring Tuesday turned into a living hell, with murderous fanatics kicking their doors in or blowing right through the living room walls. The killers did avoid beheading, and used gouged eyes, burning alive, and throat-slicing (reportedly) only with captured soldiers. Many female victims were likely raped, but this isn't known. But they hacked open several children's skulls, tore their jaws open, shot them in the face, and more. "Since it's going to demonize their hated Alawite regime," they might have reasoned, "why not pull all the stops? Just avoid the most obviously Islamist methods, y'know, for good measure." Consider Yasmeen Adel Abdulrazaq, age 9, constituting about 2% of the children murdered that day. She was gonna be something, all smiles and faintly wacky styles, seeming to favor summery yellow and peach combinations, which she was wearing again on her last day. Yasmeen's lifeless body was shown by terrorists with her skull deeply sliced open, seemingly by a sword, and a frozen look of astonished disappointment on her little face. I considered showing that right here, but on the advice of Vanessa Beeley, I decided those poor people have been shown off too much already by their killers, and it's not my readers who need that further shock (nor the depressing description and general subject matter, but ...). 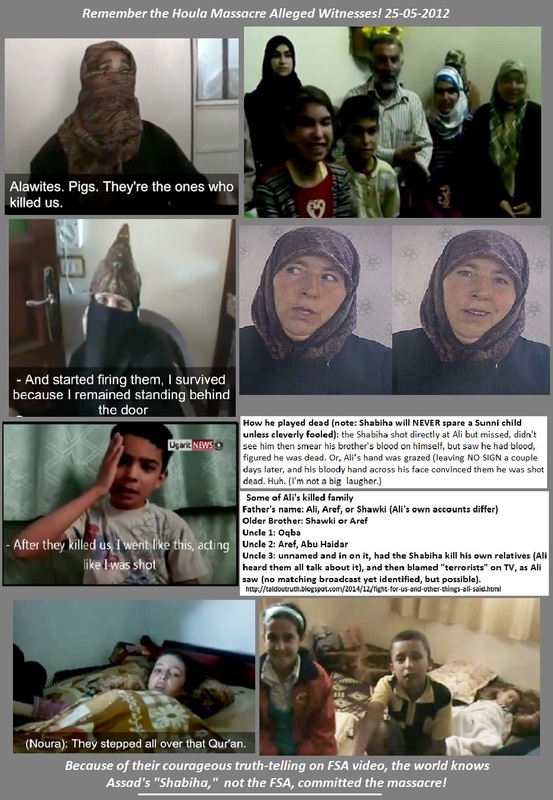 According to terrorist records Yasmeen was killed by "Shabiha" alongside sister Nour (8), brother Yaser (10), baby brother Mohamed, and mother Abeer, and may have seen some of that happen. It's not clear where their father Adel was. The Adel Abdulrazaq family were among some 80+ members of the extended Abdulrazaq clan, the core victims killed (more than the 65 generally acknowledged, including intermarriages, etc. - see here). They mostly lived down Saad road, which the UN investigators acknowledge was open to militants for the whole day (at least, after the roundabout post was bypassed around 1:30). By the most reliable reports available, it seems the Abdulrazaqs were targeted for supporting the government and rejecting the rebellion, and/or converting from Sunni to Shia Islam. Opposition sources are clear all victims - and every resident of Houla - was a Sunni Muslim. It was a 100% Sunni "town," they said, and if someone else moved in, or someone converted... that's unexplained. Perhaps they wouldn't get to continue living there. And these folks didn't get to live there past May 25. So maybe rebels lie about the non-conversion? (the remaining victims were mainly of two Al-Sayed families, who everyone agrees remained Sunni but supported the government anyway). saved by the armed groups and speaking freely? 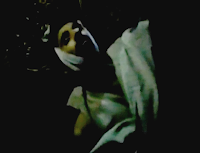 Some survivors were apparently abducted and made to blame Shabiha on video, as their blood was being poured in large jugs, like a grim stopwatch. Maybe it was a donation to help the injured, but... "Rasha Abdulrazaq" and her unnamed mother have almost filled a coffee can each as Rasha rushes through the talking points. At right, she complains about the government lies blaming the armed groups now hosting and caring for her. They ask and she thanks them profusely on the video for saving her after she somehow survived the massacre. Her living baby niece is nearby, also draining blood from her abdomen. 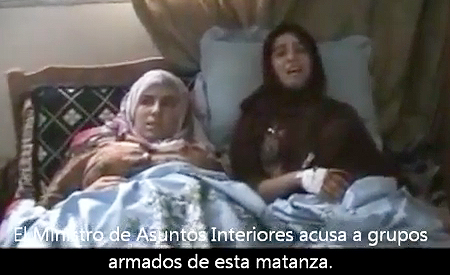 The mother blames "Alawite pigs" for killing all the Sunnis. Incidentally, different rebels to the south launched a raid, later on the night of the 25th, against the Alawite village of al-Shumariyeh, south of Lake Homs. 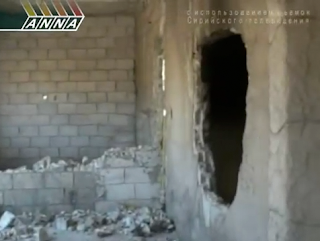 They claimed to launch a few shells, in revenge for the Houla Massacre hours earlier. But Syrian state media says they attacked and looted at least two homes, killing ten civilians, including children, and showed some of the left-behind bodies (ACLOS, Shumariyeh Massacre). (This is almost surely the cause of the mixed-up claim that an Alawite family named Shomaliya was killed in Taldou that night). 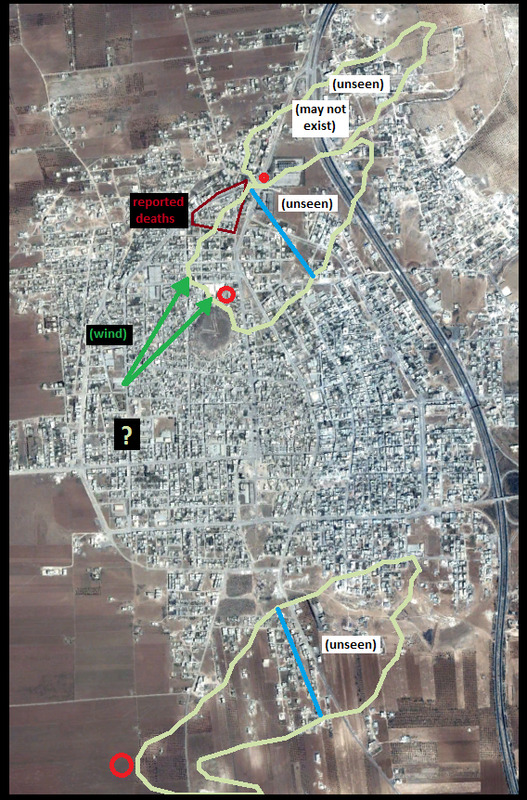 This infamous and misunderstood Houla Massacre is how the whole 3-village al-Houla area finally came under complete opposition control, back on May 25, 2012. Rastan terrorists with helpers from all over swarmed over it, killed the defenders, and massacred their local non-supporters by the family. Then, they blamed the government and had that trick work, starting the first demands for the army to leave Houla alone. It may have seemed indefensible anyway, and the state ceded the area for the time being. That began what's now five years of "liberation" as a purely Sunni, Salafist area of "Free Syria," protected by the Turks and the Saudis and their powerful allies from Tel Aviv to Paris to Canberra. To this day, the Houla-Rastan pocket is one of the protected areas under the new deescalation agreement, immune to attack, and meant as part of a permanent - but so-far discontinuous - non-ISIS opposition state you could call "Free Syria." In all areas, it's almost completely dominated by Jabhat al-Namechange, the good-cop Al-Qaeda spinoff, or someone just about as nasty. Since then, there have been less government supporters or minorities in the towns of al-Houla to massacre, but often they could be fetched from elsewhere to keep the accusations alive. 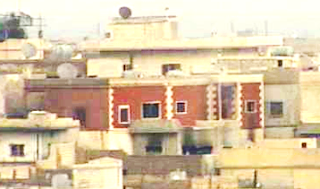 Just six months after the Houla Massacre, Aqrab's Alawite district just to the north was raided by 'rebels' from Rastan and Houla, in early December, 2012. (note May 26: It's also noteworthy that some of the Houla Massacre victims were actually from, or even killed in, Aqrab, apparently for intermarrying with the Abdulrazaqs - see here). They massacred many, chased half the people away, and kidnapped those remaining. Of about 1,500 residents, no one remained free and alive. Their homes were given to pro-opposition Sunnis, and Aqrab was added to the purified areas under full terrorist control to the present day. After the Aqrab raid, about 500 civilians wound up crammed into a house militants had surrounded, suffering a week of harsh treatment, deprived of food and forced to breathe smoke from burning tires. On December 9, about half the hostages were released in exchange for militants held by the government. But then rebels reported the government had blown up the remaining Alawite civilians, as some Shabiha among the captives also killed their own family members with bombs or hand grenades. Of 200+ people, they reported at least 125 were dead. It might take a while to dig through the rubble of a house blown up from the inside, then hit by artillery, then bombed by jets. And now, five years after the Houla Massacre, that appalling and obvious lie remains standing as a blood libel against the secular, inclusive, and demonized Syrian government. It's an affront to Humanity. How many more years will the truth of the matter remain swept under the rug? How long will it remain an example to cite when accepting yet more Terrorist accusations oozing out of "Free Syria"? Riled up in disagreement? If you can get your thinking cap on straight enough, try to review or work and bring any problems you find to the challenge space. Investigative citizen journalism! It works best when folks from different sides hash out their arguments in the open.